Hi everyone, come out and see us Friday (Dec. 8th) for 2nd Friday Night Out – Mesa – Art Attack On Main! The event is from 6-10pm. We’ll be setting up out front of Gotham City Comics and Collectibles! 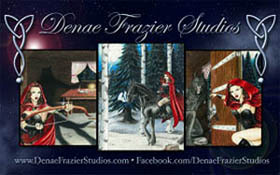 We’ll be selling Denae’s 6.75”x10.5″ and 11”x17” Art Prints, 1.5” Art Buttons, Magnets and her Pendants! Have a great week and Happy Holidays! This entry was posted in appearances, art, events, news and tagged 1.5 inch Art Buttons, 11x17 Art Prints, 2nd Friday Art Attack On Main, 2nd Friday Night Out, 2nd Friday Night Out Mesa, 6.75x10.5 Art Prints, Art Buttons, Art by Denae, Art Prints, artwalk, Denae, Denae Frazier Studios, Downtown Mesa, Gotham City Comics and Collectibles, Magnets, Make Your Mark, Pendants. Bookmark the permalink. Trackbacks are closed, but you can post a comment.